I have already covered best 120mm / 140mm case fans and best RGB fans in this blog but here I am going to list down the best 200m case fans for your computer case. You don’t find too many computer cases that supports 200mm fans because of their bigger size, but some of the bigger computer cases such as super tower cases and Mini-ITX, ATX and Micro-ATX Cube Cases supports 200mm PC fan especially on the front panel, but in some cases you may find them on the top panel too. If your PC case supports 200mm case fan along with 140mm/120mm smaller fans then it is better to install a single 200mm fan rather than multiple 120mm or 140mm fans. This is because a single 200mm will be quieter, cheaper, consumes less power, use only one connector and pushes good amount of air inside the case. 200mm fans are much quieter than the 140mm or 120mm fans because 200mm fans have bigger fan blades and they can push same or greater amount of air compared to 140mm/120mm case fans at almost half the Speed / RPM of the smaller sized case fans. For example, if 140mm fan has airflow of 80CFM @ 1600 RPM then the same airflow can be achieved by a 200mm fan at around 800 RPM only. Also, the power consumption of a 200mm fan is almost the same as of a 140mm or 120mm ones. It must be noted that 200mm computer fans can be both airflow and static pressure type ones. Here in this post I am going to list down some of the best 200mm case fans for use in your computer case for increasing airflow. Here are some of the top high performance 200m PC fans that you can use in computer case as a front fan, side fan or top fan. 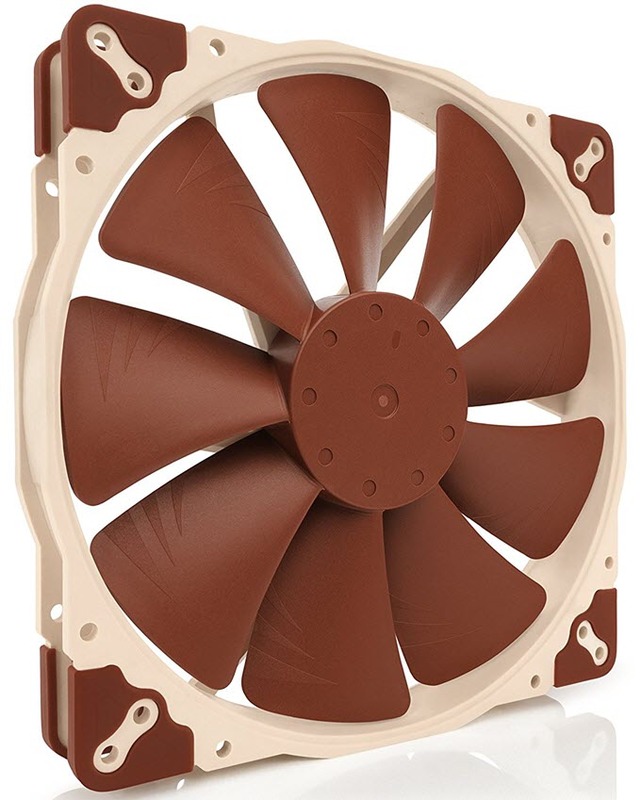 Noctua is undoubtedly the king when it comes to case fans. Here we have Noctua NF-A20 PWM which is a high performance and silent 200mm case fan that comes with 4-pin PWM connector. This 20cm fan uses Noctua’s Proprietary SSO2 bearing which is one of the best bearings out there. The speed of this 200mm fan ranges from 350 RPM to 800 RPM but with a low noise adapter (LNA) it spins at 550 RPM at max. 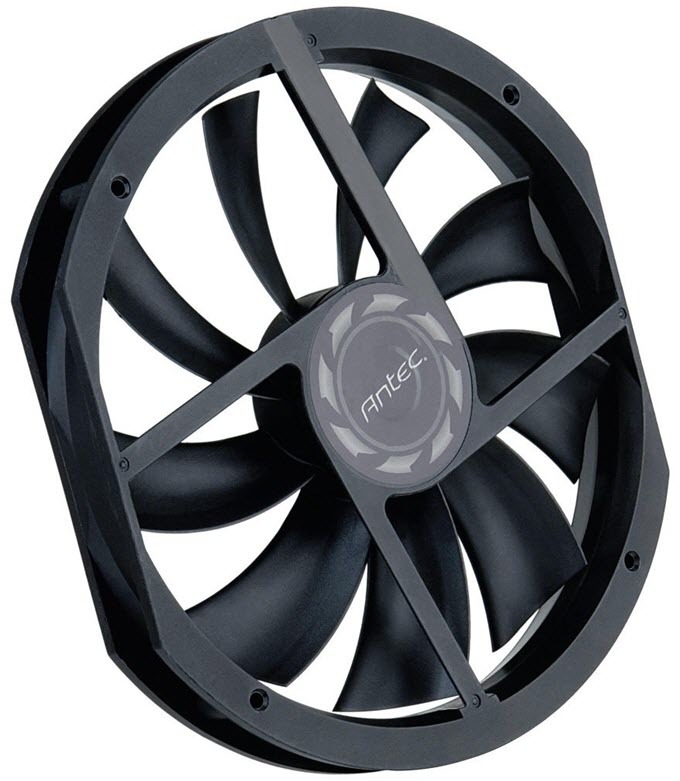 This 200mm fan pushes good amount of air inside your case and has airflow of 86.5 CFM. It is very quiet in operation with maximum noise level of 18.1 dBA. It also comes with anti-vibration pads as to resist shocks and it minimizes the noise to almost null. The speed of the fan is adjusted automatically by the system or motherboard because it is PWM controlled. The fan has great build quality and looks very classy. The fan comes bundled with extension cable and y-cable for running two PWM fans on the same header. It is slightly on the expensive side but is totally worth the price you pay for. Highly Recommended by me if budget is not a concern and you want a high performance and silent 200mm fan. There is also a 3-pin connector version available for this fan which is Noctua NF-A20 FLX. It has almost the same specs and performance as of NF-A20 PWM but comes with a 3-pin connector with no variable speed adjustment. You can check both these Noctua’s 200mm fans from the links given below. Note: Some 200m fans are only 20mm thick but these NF-A20 fans are 30mm thick, so you have to check your case specifications for their compatibility with them. This is because there is no fixed industry standard for the size or hole spacing of 200mm, 220mm, 230mm or 250mm fans. This rule also applies to the other 200mm case fans in this list. Cooler Master MegaFlow 200 is one of the cheapest and most popular 200mm fan that you can buy for your PC case. This budget 200mm case fan comes with sleeve bearing which is obviously not the best bearing types but it does the work pretty well and has rated life expectancy of 30,000 hours. This is a single speed fan having 700 RPM and has got 3-pin connector (12V). It does include a 3-pin to 4-pin Molex power connector in case you fall short of 3-pin connectors on your motherboard. The build quality of the fan is pretty decent but it does lacks anti vibration pads or rubber corners for shock absorption. The fan moves tons of air and has maximum airflow rating of 110 CFM. It is also quiet in operation and has maximum noise level of 19 dBA. 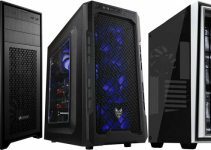 It is officially compatible with Cosmos S, ATCS 840, HAF 932, HAF 922 and Storm Sniper computer cases. The fan is also available in Red LED and Blue LED variants which can also check out from the link given below. 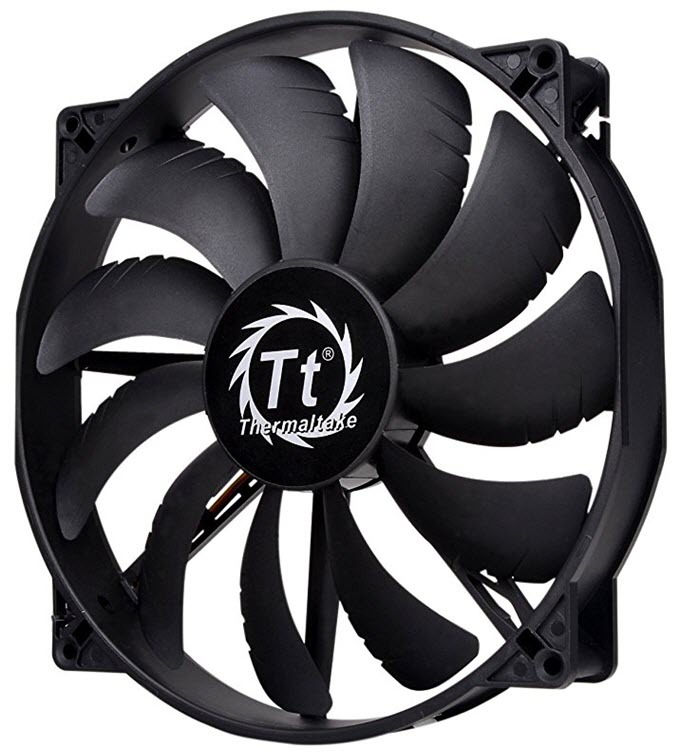 Thermaltake Pure 20 Fan is a budget 200mm case fan that offers great performance for the price. The fan has speed of 800 RPM and comes with cheap Sleeve bearing. The fan has got 3-pin connector but it also comes with 3-pin to 4-pin molex connector as an extra option for powering the fan. The build quality is on the average side and it lacks anti-vibration rubber pads. The fan pushes great amount of air inside the case @129.6 CFM but is relatively louder than the competition with maximum noise rating of 28.2 dBA. There is also a blue LED version available for this 200mm case fan which you can check out from the link given below. Here we have a 200mm RGB fan from Cooler Master. This is a stylish, high quality and good looking 200mm fan that also churns out very good performance. The fan comes with Rifle bearing and spins at 800 RPM. 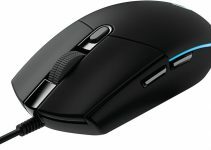 It has got 3-pin connector but for RGB effects you have to buy Cooler Master RGB LED controller for it. The fan blades are of milky white color and the fan blade design is inspired by both Jet engine and helicopter blades designs. It also has a JAM feature where the fan can shut off completely when it detects some intrusion in the fan blades, thereby protecting the fans blades, cables / wires or other computer components. The fan has airflow of around 90 CFM which is pretty good but it is a bit noisy and has noise rating of 28dBA. For reducing noise and vibrations, it has got rubber pads on the corners. This 200mm RGB case fan is compatible with Asus Aura, ASRock RGB, Gigabyte Fusion, MSI RGB softwares. So, if you are looking for a fancy RGB 200mm fan to light up your case then this is the one to go for. A premium 200mm case fan from the house of Phanteks. This is a high static pressure 200mm fan that is intended for front use only. 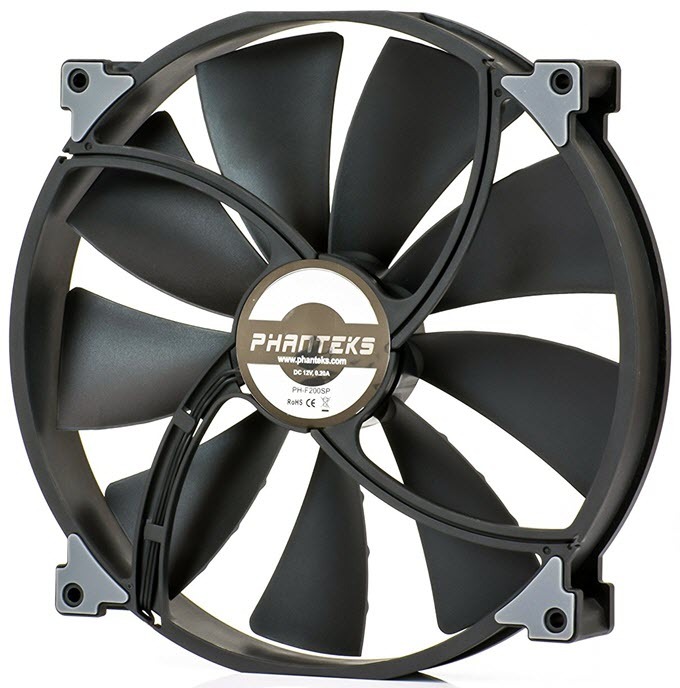 The fan comes with Phanteks’ UFB bearing that has an effective hub-tip ratio to achieve a state of equilibrium reducing air and vibration noise. The fan spins at 850 RPM which is pretty okay for a 200mm PC fan. It is a well made fan with solid build quality and comes with 3-pin connector. It can achieve airflow of 110.1 CFM which is quite a lot but it is not a super silent fan and has noise level rating of 25 dBA. The fan has got eight pre-installed rubber pads on all four corners to reduce vibration and noise generated due to it. The fan has static pressure of 1.04mm H2O and comes with 900mm long cable (Fan cable length 500mm + Extension Cable length 400mm). There is also a white fan blade version available for this fan model and you can check both these variants from the link given below. Antec Big Boy 200 is a powerful 200mm Tricool fan from Antec. 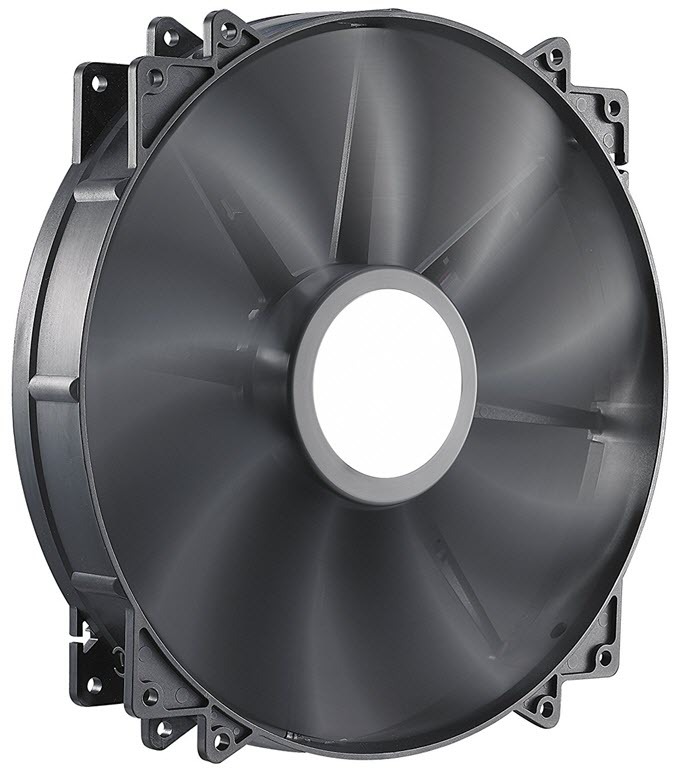 This 200mm case fan has one the highest airflow among all 200mm fans at 134 CFM at full speed. This 200m fan has got an unconventional design and comes with reliable double ball bearing. This big boy from Antec comes with 3 Speed Switch that allows you control speed of the fan manually using it. The three speed settings are 400, 600 and 800 RPM but the downside is that the switch has to controlled from the inside by removing the case panel. For silent environment you can set the fan speed at lowest value and for maximum performance you can set it at the highest one. The fan is powered by a 4-pin Molex connector which might not appeal to some users. The fan is pretty well built but it lacks rubber pads for minimizing vibrations and noise. It is silent at lower speeds but can be loud at highest speed i.e. at 800 RPM. So, if you are looking for a fan with speed adjustment which is not PWM then you can go for this one. It is also quite affordable and is quality product from Antec. This is a slimmer 200mm case fan having thickness of only 25mm, as all the other 200m fans in this list are 30mm thick. This is a static pressure fan that comes with fluid dynamic bearing and has fan speed 900 RPM. 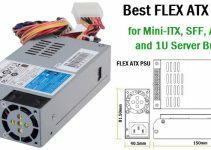 The fan comes with 3-pin connector and can also be connected to 4-pin Molex connector using a 3 to 4 -pin adapter. The one great thing about this 200mm fan is that it has multiple installation holes / points on all four corners which makes it widely compatible with most of the computer cases. The construction quality of this fan is on average to good side. It is best to use this 200mm fan as front intake fan only. 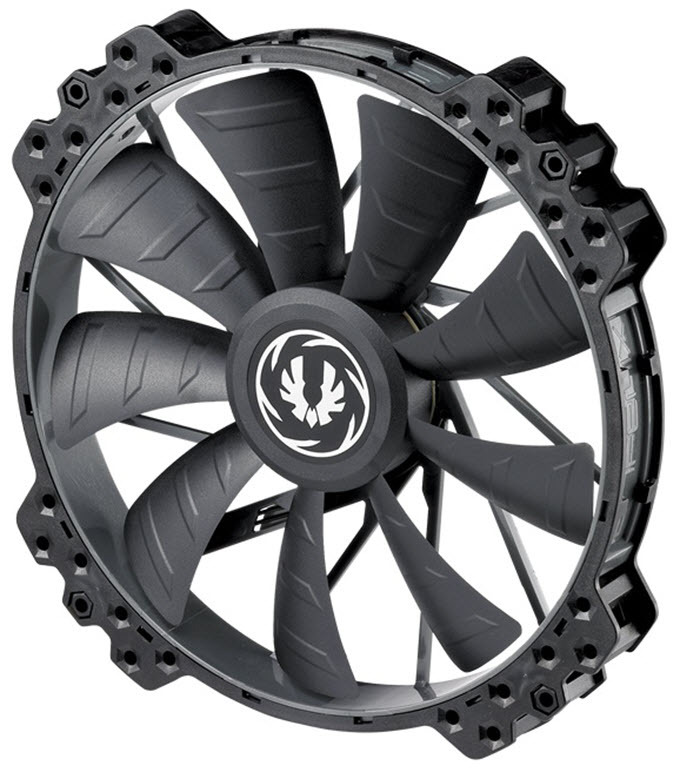 The fan pushes huge amount of air @148.72 CFM which is a lot and highest in this list of 200mm case fans. It can be a little noisy and has noise level rating of 27.5 dBA. Features include High Pressure / CFM Design, Dual Frame Construction and Reinforced Fan Blades. It is also available in white color which you can also check out from the link given below. 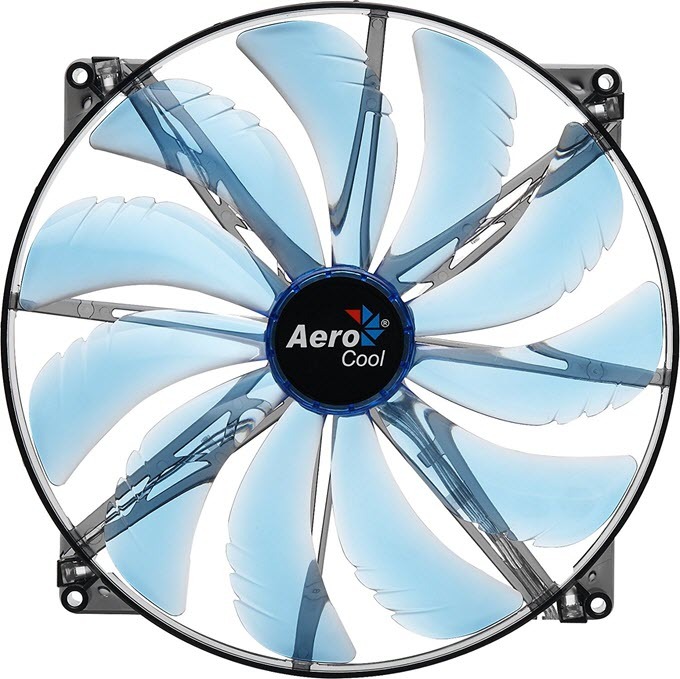 Here we have a 200mm LED Fan from AeroCool which is a pretty decent company. The fan is available in blue / red / green / white LED variants with four LEDs on each corner and has got transparent kind of fan blades. This is a budget 200mm LED fan that comes with Sleeve bearing and has fan speed of 800 RPM. You can connect this fan using 3-pin or 4-pin connector. The construction quality is on the average side and cannot be compared to the 200mm fans from bigger brands like Noctua, Phanteks, Thermaltake etc. mentioned above. The fan pushes relatively lesser air (76 CFM) compared to other 200mm fans mentioned above but it is very silent in operation with noise level just at 18 dBA. Overall, a decent 200mm fan with attractive looking LEDs and design. Another LED 200mm fan but this one is from NZXT. 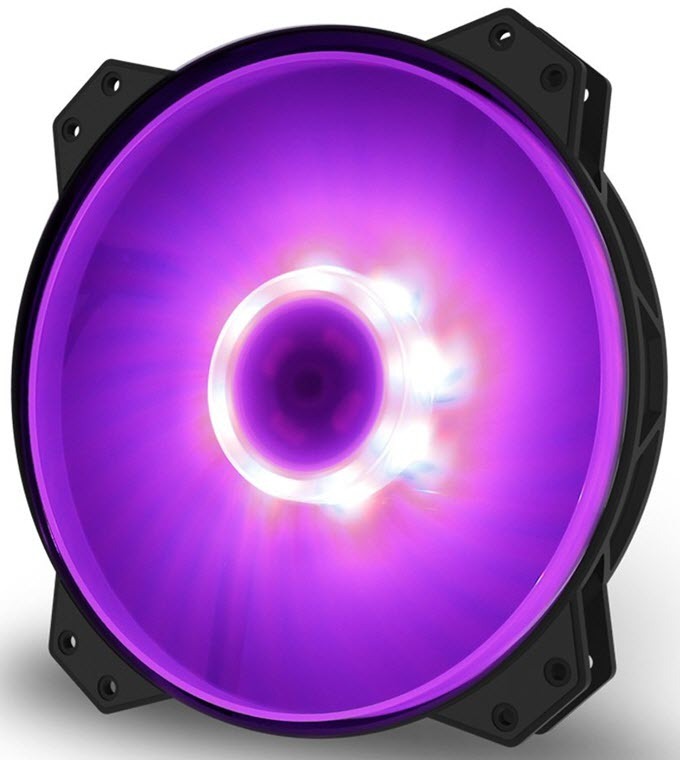 NZXT FZ LED 200mm Fan comes with blue, red, green, orange or white color LEDs. However, there is non-LED version of the fan is available too for people who don’t like distraction due to LED lighting. The fan comes with 3-pin connector and maximum speed of 1200 RPM. This is just a basic 200mm fan with LED lighting and it generates airflow of 59.1 CFM which I think is on the lower side compared to the competition. This NZXT 200mm fan comes with new standard 154mm spacing and is compatible with Phantom 820, Phantom 630 and Future NZXT Cases. The fan has low noise levels at 26.8 dBA and is on the silent side of the spectrum. Not the best 200mm out here but if you want something officially compatible with your NZXT case then you may think about it. If you are looking for a 200mm RGB Fan then Thermaltake Riing Plus 20 LED RGB is the answer. This 200mm RGB case fan comes with 12 addressable LEDs sets (2 single LEDs per set) with 16.8 million colors. This is a variable speed PWM fan having speeds in range of 500 to 1000 RPM but it can only be used with the Thermaltake RGB controller. The fan generates airflow of 117.96 CFM which is on the higher side of the scale. It has great build quality and comes with ant-vibration rubber pads on the corners for reducing noise. It has got 11 fan blades that are black in color. I would have preferred the fan blades to be translucent or transparent for better showcasing of RGB lighting in full glory. This RGB 200mm case fan supports voice control / commands and you can change the RGB lighting, brightness & effects and fan speed with voice input commands using the Thermaltake’s Patented TT RGB PLUS Software & App. The fan also supports third party services such as Amazon Alexa and Razer Chroma ecosystem for controlling RGB lighting and fan speeds. 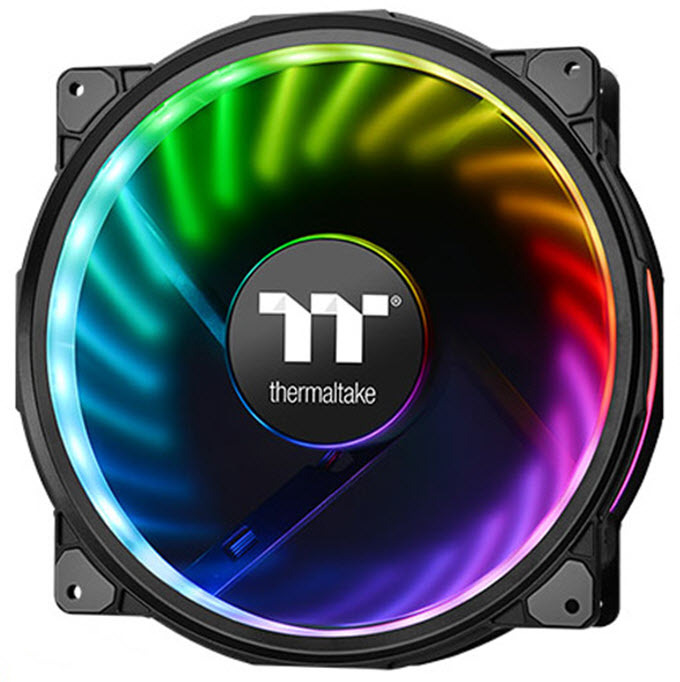 I think this is the only 200mm RGB fan available right now but the flip side if that it can only be used with Thermaltake RGB controller which you have to buy separately. 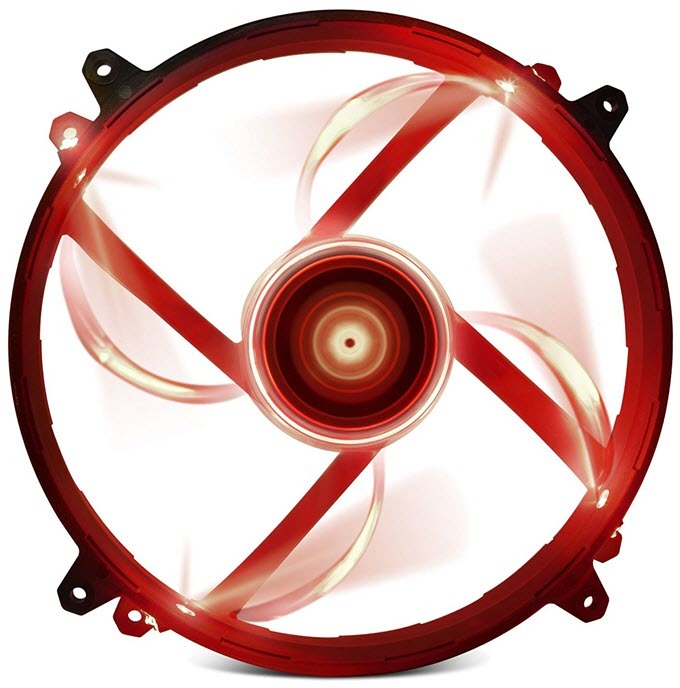 Here I have listed the best 200mm case fans that you can get online or in the market. These fans are up to the mark and are very reliable. They deliver good performance and pushes great amount of air in the case thus enabling greater airflow which helps in reducing temperature of case and computer components. Fans from bigger brands should be considered first if budget is not a major factor. If you have got any queries regarding compatibility or performance of these 200mm case fans then you can ask me them by leaving a comment.